Perhaps it is God’s will to lead the people of South Africa through defeat and humiliation to a better future and a brighter day. What was everybody’s business in the end proved to be nobody’s business. Each one looked to the other to take the lead, and the aggressors got away with it. 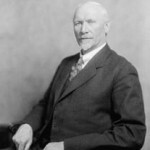 Jan Christiaan Smuts was a prominent South African and British Commonwealth statesman, military leader and philosopher. In addition to holding various cabinet posts, he served as Prime Minister of the Union of South Africa from 1919 until 1924 and from 1939 until 1948. He was a supporter of racial segregation and white minority rule.